Brisket gets rubbed with salt and pepper and smoked for 14 to 15 hours. 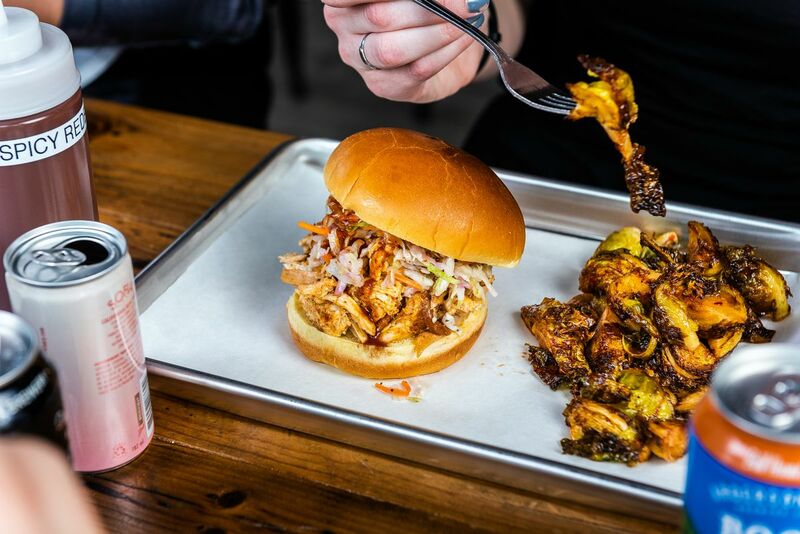 A new barbecue restaurant and whiskey bar will open next week in the former Ruta del Vino space in Petworth, replacing the Latin American wine bar on Upshur Street NW. 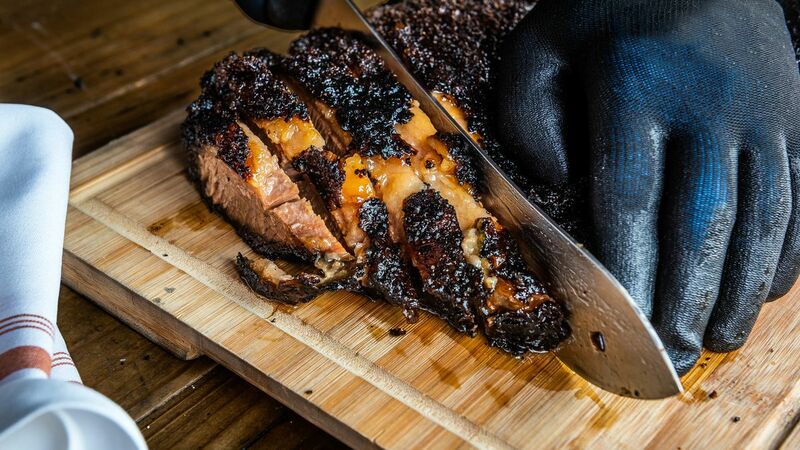 Starting Saturday, April 13, Cinder will showcase Texas-style brisket, Southeastern-style pulled pork, and more smoked meats from roving pitmaster Bill Coleman. Coleman has run a catering business based in College Park, Maryland, for the past 16 years. He’s also attended barbecue training through the meat sciences program at Texas A&M. 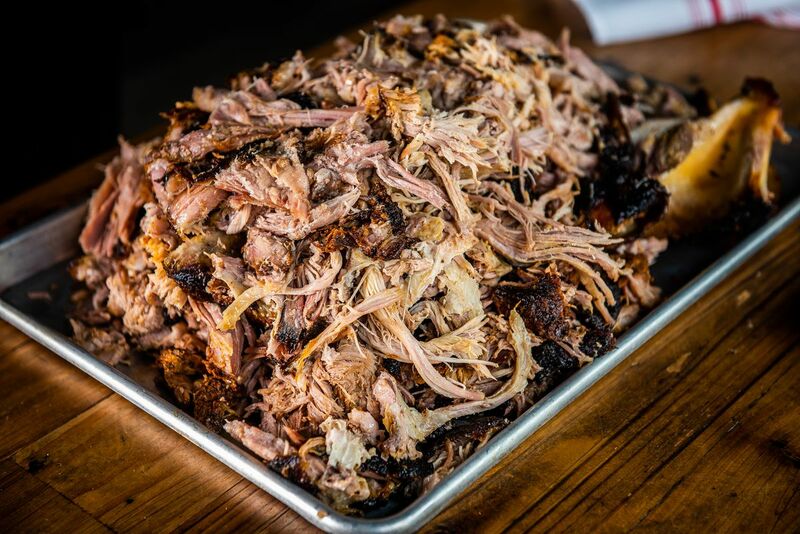 Matt Krimm and John Anderson, co-owners of the Civil cigar lounge in Friendship Heights, hired the barbecue veteran for Monday Night Football tailgates before partnering with him on his first brick-and-mortar. 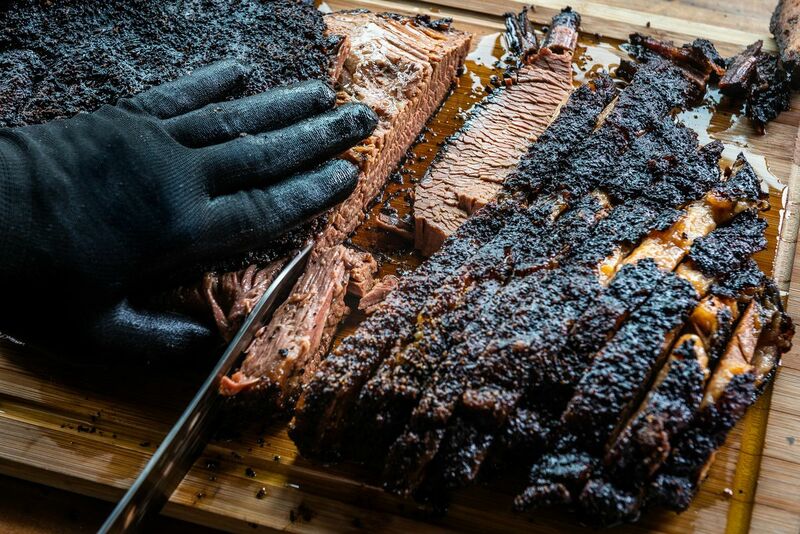 Selling brisket immediately puts Cinder into competition with Federalist Pig, Hill Country, and DCity Smokehouse in D.C. Cinder’s beef is treated with a simple salt and pepper rub and smoked 14 to 15 hours overnight with Coleman’s proprietary mix of wood. The pitmaster has developed a spicy “Redemption” barbecue sauce made with Redemption bourbon to pair with the beef. Coleman also has a sweet apple cider vinegar sauce he used to sell commercially and a Eastern Carolina vinegar sauce that’s a natural fit for pulled pork. Everything at the restaurant will arrive with a dry rub, and customers can add sauce on their own. While brisket and pork shoulder will be overnight endeavors, Krimm says Coleman will smoke chicken wings and ribs in the mornings. Ruta del Vino already had two ventilation hoods set up to accommodate a wood-burning grill, so Cinder didn’t have to renovate the kitchen to install a smoker. Meat is unquestionably the star of the show, but vegetarians can opt for a roasted cauliflower entree with brown butter, pumpkin seeds, cilantro, and lime. Krimm says he had to talk Coleman into omitting bacon from bourbon-peach baked beans. He refused, however, to compromise his collard greens in the same way. Roasted cauliflower, wings, and sandwiches. Krimm lives four blocks away from the new restaurant in Petworth. He says he and Coleman have batted around the idea of opening a restaurant for years, and the space was too good to pass up. The large, square bar will be a platform for Krimm and Anderson, who will source a global selection of about 100 different whiskeys. They’ll always have a rotation of three spirits from Kentucky-based Willett distillery. Krimm says other specials will highlight rare and limited releases. Given the sensitive nature of barbecue, the group has been appropriately patient with ramping up their opening. Cinder has already held two weekends of pop-ups and will run more this weekend. Krimm says Coleman has been figuring out the best way to preparing smoked meats for service, tweaking moisture levels and holding times in the restaurant’s oven. “We didn’t just want to open and make everybody mad and look like we didn’t know what we’re doing,” Krimm says. A smoked chicken sandwich and Brussels sprouts. 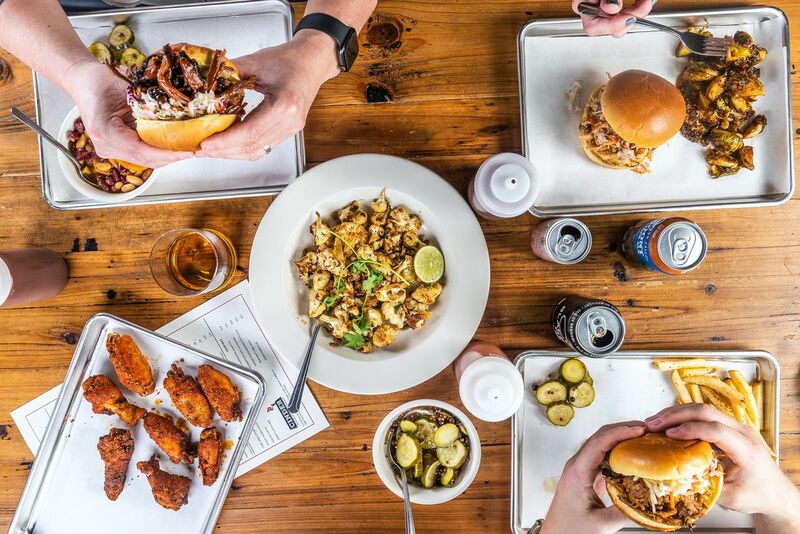 At 5 p.m. on Saturday, Cinder will sell plates of half-smokes, collards, slaw, and pickles with a Founders Solid Gold Lager for $10 until supplies run out. The restaurant will swap out sausages for pork ribs with the same format on Sunday. Cinder will be open Wednesday through Sunday from 5 p.m. until 11 p.m. or midnight, depending on demand. Krimm says Sunday brunch will start soon after opening, and the restaurant might open for Monday Night Football games in the fall. The incoming barbecue joint isn’t the only business breathing new life into Upshur Street. Dos Mami’s, a wine bar from Himitsu’s Carlie Steiner and Taqueria del Barrio’s Anna Bran-Leis, is moving into the building that used to house Hank’s Cocktail Bar, which has since moved to Dupont Circle.